The 2018 Nissan LEAF in Mesquite is back and better than ever. Featuring revised styling, a new powerplant and loads of tech, the all-electric car near me is just what you've been waiting for. On the outside, the vehicle gets a complete makeover. Highlights include a new V-motion grille, new headlights and taillights, and crisp, clean lines that add fashionable flair to the car's overall appearance. On top of these perks, every new LEAF is fitted with e-Pedal technology, making it possible for drivers to decelerate, accelerate and stop with the accelerator pedal. This advancement allows for a more enjoyable time on the road, as drivers are able to steer clear of having to move their foot back and forth from brake pedal to accelerator. Discover all that this five-passenger vehicle has to offer in our in-depth 2018 Nissan LEAF review below. Like before, the LEAF is offered in S, SV and SL trims, making it easy to satisfy a wide range of driver needs. 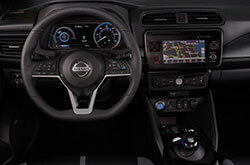 The inside features vibrant blue stitching, a brand-new 7-inch touchscreen display, a new dash and seats. Excellent connectivity features such as Bluetooth and a USB port will help you stay connected on the road. Even more amenities can be had on the top-ranging SL trim, as noted by 2018 Nissan LEAF reviews. They include a premium Bose audio system that delivers exceptional sound quality, leather upholstery, LED headlights, navigation and a 360-degree camera system. 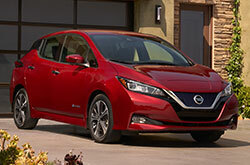 Every 2018 Nissan LEAF in Mesquite employs a brand-new engine, featuring an improved lithium-ion battery pack that is capable of achieving a 150-mile range. Together, the engine and battery are able to put out 147 horsepower and 236 pound-feet of torque. 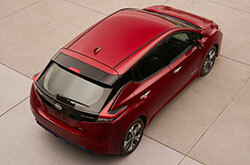 Also new for the current model year LEAF, is Intelligent Ride Control, which offers an enhanced driving experience. Nissan makes safety a top priority, and it shows in the 2018 LEAF. 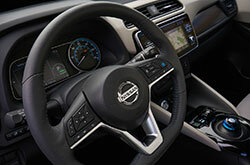 Standard, the car is equipped with seven high-quality airbags, antilock brakes and a rearview camera for added safety. Driver-assist technologies such as lane departure warning, rear cross-traffic alert and blind-spot monitoring are also available. Disculpe, no tenemos inventario destacado en nuestro sitio web en este momento. Llame al 833-628-6546 para obtener asistencia adicional. 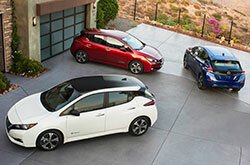 Obtain All the Latest Info on the Nissan LEAF! Have the 2018 Chevrolet Volt, Toyota Prius and the Ford Fusion Hybrid commanded your attention? 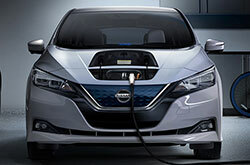 Then you should also think about buying a 2018 Nissan LEAF in the Dallas area. The car's luxury cabin amenities and eye-catching exterior styling could wind up being just what you from a daily driver. After you finish our 2018 Nissan LEAF review and try out the comparison tool, view factory incentives offered at Trophy Nissan. We're a resident car dealer with a large number of factory incentives on new and used car models, including the Nissan LEAF. We hope our 2018 Nissan LEAF review provides assistance when you're prepped to make your ultimate buying decision. We have numerous Nissan LEAF models for sale in Mesquite, TX; stop by to be thankful for a test drive - setting up an appointment online is easy. Also take a few minutes to watch our video clip, which highlights the car's trendy features!